The NEW gardening tool that is twice as effective at cultivating the soil and three times faster than digging by hand. REVIEWERS ARE SAYING IT IS THE BEST GARDEN TOOL THEY HAVE EVER OWNED! We all watch the garden shows and see them digging into nice soft soil. It all looks so easy. Add compost they say.. add some manure.... All great advice but the real truth is that you would do all those things if it wasn't so bloomin hard to dig the ground in the first place. Too often I hear people say they want to do more gardening, and more planting, but they are waiting on someone else to dig the hard ground! But we know it will be a month of Sundays before that happens and meanwhile all the beautiful plants you bought are starting to dry up in their pots and there's some more money wasted and no doubt a bit of guilt in having not got them in the ground. Now you might be the physical one who does all the digging yourself, and good on you for putting in the hard work, but if you are anything like me, that aint the most fun part of gardening and I bet you secretly wish there was someone else around to do the digging for you. This is why I'm so excited to share this innovation that literally turns your ordinary drill into a soil digging machine. And using the word machine is no exaggeration by the way. This thing eats tough dirt for desert! 3 inch wide hole with a 24 inch shaft means you can use it whilst standing up. Great for when you have a fair bit of digging to do and you don't want to be on your knees the whole time. To cultivate a garden bed really well, just drill a 100 holes (which will only take a few minutes) and then move sideways between them to really churn up the soil just like an expensive rotary hoe would do. Brians tip: Take a look at the Perfect Power Planter Kit for Gardeners to get the most useful combination at a discounted price. 2 inch wide hole by 7 inches deep is perfect for seedlings of flower and vegetables. 3 inch wide hole by 7 inch deep - General planting when you are on your knees down in the dirt. 3inch wide hole by 12inches deep. Use this for deep cultivation to a foot deep. Planting larger plants and ensuring the soil is well prepared. It actually works so well, you will be wondering what to do with all your old gardening tools... most of them can stay in the shed and gather dust because once you use a Power Planter you will scoff at the thought of bringing out those backbreaking ones ever again. Imagine soil so soft you can run your hand straight through it... Imagine planting vegies and seeing them thrive... Imagine getting a load of rich compost and being able to really mix it in with your existing soil and know that your garden is going to step up to a whole new level. That dream is only a small step away when you get your hands on a Power Planter. Now if you're a bit of a sceptic like me and part of you is saying... this sounds too good to be true. How could a cordless drill be powerful enough to dig my hard ground? "What a Godsend... We usually have the spade, pick and crow bar to dig as we have a lot of clay and rocks, but the POWER PLANTER™ went through it like a hot knife in butter..."
"Absolutely loving using the POWER PLANTER™ As a landscape gardener we found the 3 Power Planters we purchased a breeze to use and we were able to complete a rather large planting job with ease and much quicker than digging by hand. I would definitely recommend to others"
"Hi Brian, You have a real winner here. My daughter bought a POWER PLANTER™ from you for Father's Day and already it has been a great bonus to my gardening equipment. I mixed my own potting compost today using an 18v battery drill mixing the various components in a wheelbarrow using the POWER PLANTER™ instead of the tedious hand or shovel mixing. It was great and did the job perfectly. We have also over the weekend, put in Liliums, bedding plants and some medium sized natives using the POWER PLANTER™ with so much ease I don't know why no one thought of it before. After all, I have a post hole digger on my tractor so it seems such a logical step. A great tool and every gardener, serious or not, should have one." Jason Hodges from Better Homes and Gardens tried it out on his property at Berry, and he excitedly called me up that night to say it was "Absolutely brilliant" Every landscaper should have one... He then went on to say that it was the best product anyone had ever put in front of him...ever! Well, my personal theory is that the harder the ground the smaller the tool needs to be. Just like when you are drilling through steel you need to use a small drill bit first and then progress up to a larger bit. The Power Planter is like a very small post hole digger and its unique design cuts easily through even the toughest of clays, just like the pilot hole from a small drill on steel. 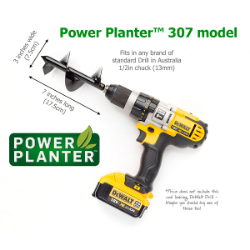 As long as you own an 18V cordless drill, or a 240v Power Drill, you can attach the Power Planter and have some fun drilling holes instead of digging them the hard way. People who have used it have said that is actually FUN to dig holes now. One lady said... her husband finished up in their place and then went next door to see if the neighbour needed any digging done! Now if you aren't getting excited by the thought of this wonderful little tool, then either you 1. Don't have a garden.. or 2. You need to check your pulse and see if you're still above ground. This has got to be the biggest innovation in gardening for at least a decade and is going to make a lot of things possible for a lot of people. IT MUST BE EXPENSIVE THEN! So how much do think a Power Planter is? $200? $300... I know there would be landscapers out there who would be willing to pay $400 easily for the time saving alone! To be able to take away the pain of swinging a mattock over and over or seeing your garden fork turn into a twisted piece of metal as it fails to get through the ground has got to be worth it. Your soil may not be that hard, but for a lot of people it can seem like they are doing a better job breaking a sweat than breaking the ground. Speaking from my own experience, since owning a Power Planter, I don't have that pain anymore. Now I can head out to garden with my cordless drill, and a pair of gloves and maybe a small hand spade. The Power Planter churns up the soil just like you see on the gardening shows and it's then so easy to add compost, some gypsum and manure and as a result my garden is now thriving with the attention it is getting. 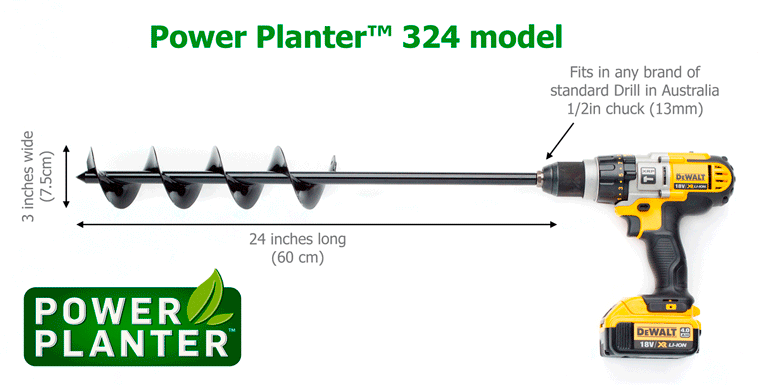 The Power Planter comes in 4 sizes perfect for the home gardener and the price is a very affordable $55.00 - $125.00. That's it! So that means you can buy them and it won't break the bank... but it will certainly save your back. We also have a package deal kit for serious gardeners which I highly recommend as it covers all the different situations you will want to use them. 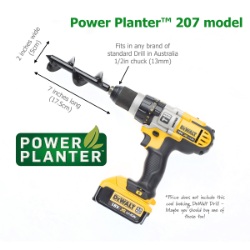 Now before you go racing off to Bunnings asking them where the Power Planters are... they are not in stores. The only way you can get one is through this website and we will post it out to you usually on the very same day. And what's more, just to give you peace of mind, I am going stick my neck out and cover it with a simple 'Love it or return it' 30 day money back guarantee! I'm so sure that you are going to love it and rave about it to all your friends that I'll take the risk in giving you the option to return it if you aren't happy. I tell you what...I'm a happy man. Yeah sure, I'm making a bob selling these things... but I tell you what makes me really happy is having found a way to help people do things they never thought possible! 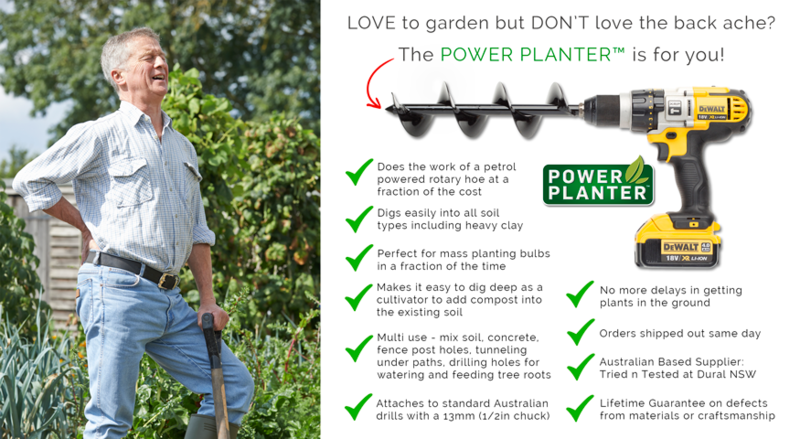 With a Power Planter it's like you have the strength of Sampson (he's a strong bloke in the Bible) and I'm on a mission to share this with ALL the gardeners and DIYers in Australia because it's too good a secret to keep to myself. I just had a bloke write to me who had a busted hip and was on crutches. So he wrote.. he had one hand on his crutches and the other using the Power Planter and he was still able to get the job done (love that Aussie spirit) Now I don't recommend you use the Power Planter one handed, but it does make me smile hearing stories like this. They are selling fast and we have run out of stock 3 times already. So get onto ordering a set for your garden and stop doing things the hard way. It will open up a whole new side to gardening where you can really enjoy it... Who knows, you might even be able to get the kids out there giving you a hand once they see the new toy! Order a POWER PLANTER™ NOW to make YOUR gardening work easy and fun! Its quite mesmerizing watching it drill into that soil like a hot knife in butter! It actually makes digging holes fun! 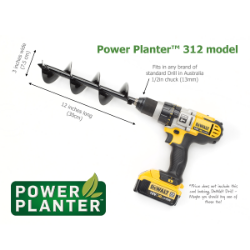 Even heavy tasks that would have required tools like a mattock, a crow bar, fork and spade can now all be done in a fraction of the time using a cordless drill and the POWER PLANTER™ attachment. Ranging from $55-$125 depending on the model, it is the biggest innovation in gardening this decade and actually makes digging holes fun! "Being in my late 60s and suffering from arthritis in my arms and hands i wasn't able to dig holes in my garden , always had to wait for someone to do it for me,now it's a breeze can do it myself - amazing tool and so easy, already told some of my friends,i will buy another one from you when needed, thank you 10/10 cheers"
"We have very heavy clay soil and it has always been a constant battle to till. After seeing this I bought one and can now turn over the garden beds and add mulch to the soil in no time. If you don't have one of these get one. " "Used it for the first time today, Its amazing, got through the toughest ground with ease." "The ground here in Charters Towers is very dry and hard. I was impressed with how the Power Planter performed even when it hit rock, the blades showed no sign of damage. " Better Homes and Gardens LIVE. Thousands of gardeners attended the Better Homes and Gardens Show at Sydney's Olympic Park this Spring and got to try out the new Power Planter™ for themselves. There was plenty of 'oohs and wows' as it dug effortlessly into a range of soils including compacted clay. TV Show Presenters Jason Hodges and Graham Ross were both very impressed by the Power Planter and were keen to use it in their own gardens.